Back on September 10, 2007, ISFOC, Instituto de Sistemas Fotovoltaicos de Concentración S.A. or Institute of Concentration Photovoltaics Systems, disclosed the companies and their bids for the installation of 1.3MW (Mega-Watts) of CPV (Concentrator PhotoVoltaic) pilot power plants in Call for tenders. 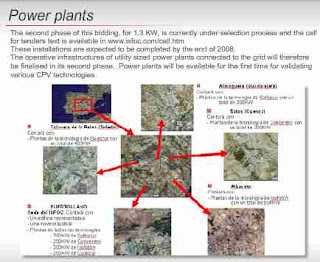 These plants will be installed as part of the infrastructure of ISFOC in Castilla La Mancha – Spain as a national and international reference in the concentration photovoltaics field. The final selection process is slated for completion by the first week of November 2007, and the successful bidders will install their pilot plants in 2008 per the requirements articulated in the call for tenders. This 1.3MW tender is the second phase of a 3MW CPV pilot plant program. The first 1.7MW phase of CPV pilot plants have been awarded to Isofoton (700kW), SolFocus (500kW), and Concentrix (500kW). Installation of these is underway and should be operational in the first half of 2008. 800kW of this capacity will be installed near ISFOC in Puertollano, Castilla La Mancha – Spain: SolFocus and Concentrix with 200kW each and Isofoton with 400kW. The balance of the pilot plants from the first phase are single company pilot plants located in rural areas of Castilla La Mancha each with differing microclimates and solar radiation. Isofoton will install 300kW in Talavera de la Reina near Toledo, and SolFocus will install 300kW in Almoguera near Guadalajara, the coldest area in Castilla La Mancha. Meanwhile, Concentrix is installing 300kW in Sotos, located north of Cuenca. One reference on the ISFOC website appears to show participation by GUASCOR FOTON in the first phase, but this is not in the ISFOC paper or poster cited below. ISFOC was started by a Government of Castilla La Mancha initiative commissioning the Institute of Solar Energy – UPM (Universidad Politécnica de Madrid) to develop a CPV R&D plan. Professors Antonio Luque and Gabriel Sala formulated the plans for the implementation of ISFOC and the Scientific International Committee (SIC) supervising the technical management. ed ISFOC’s first phase with €20 Million covering infrastructure, personnel, and a new headquarters and lab facility. ISFOC’s main objective is to promote CPV Systems implementation, helping so its industrialization and commercialization. Companies are invited to joint efforts towards the acceleration of development and starting up of concentration plants, and ISFOC will deliver technical reports on their operation. One of ISFOC’s main goals is to generate international R&D projects on CPV installations. For reference, here is the Visual (Poster) Presentation and paper with further detail on the formation and governance of ISFOC from the 22nd EU PVSEC. Given this is La Mancha, I refuse to make veiled references to Don Quixote tilting at two-axis CPV trackers.